Share Your Voice Eagle River! This event is free and registration is preferred. You are invited to share your thoughts and ideas with the Wisconsin Historical Society as we seek to create a modern, state-of-the-art history museum that connects and tells the story of all Wisconsinites. 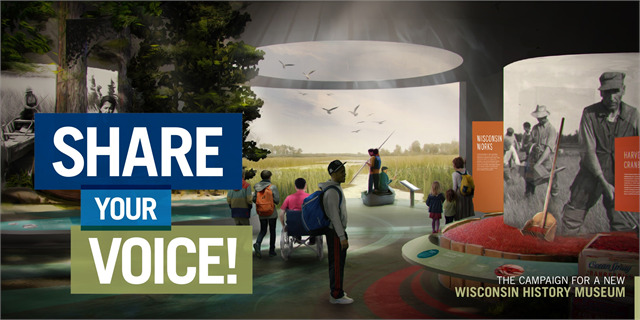 Your participation will inspire conversations, create connections across the state, and provide invaluable feedback on design concepts for a new Wisconsin history museum. Now is the time to share your voice and be a part of this rare opportunity to celebrate and honor Wisconsin. This public forum is free and open to everyone. Advanced registration is preferred! This event is co-hosted by the Eagle River Historical Society.